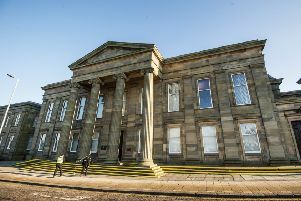 A banned driver narrowly missed pedestrians including police officers when he careered around Bellshill town centre. William Higgins was out of control after taking drugs, Hamilton Sheriff Court was told. His Vauxhall Astra mounted the pavement and twice struck railings before one officer grabbed the keys from the ignition and prevented him from causing further damage. Higgins (26), of Coatbridge, was jailed for 26 months. He admitted driving dangerously while disqualified and under the influence of drugs in the early hours of December 11. He also admitted causing a scene at Wishaw General’s accident and emergency unit where staff were trying to assess his condition. Callum Forsyth, prosecuting, said the near misses happened around 1am when the town centre was busy with people leaving pubs. Higgins was seen to go through a red light in Hamilton Road and turn into Neilson Street where his car was travelling at speed, forcing pedestrians to jump clear. Officers were “shocked” as they saw him mount the pavement, narrowly missing bollards. With their blue light flashing, they followed him and he crashed into railings in Motherwell Road. The police tried to box him in, but he drove on before hitting another barrier. This time the car was “entangled” with the railings. An officer used his baton to smash the window and reached inside to grab the keys from the ignition. Higgins was unable to follow basic commands and officers suspected he was under the influence of drugs. Defence agent Rowan Myles amitted his client has a “very poor” record and said he seems to cope better with life in prison where “he has a roof over his head and his meals are provided”. Sheriff Ray Small said Higgins, who has been in custody since his arrest, has an “appalling” record for driving while disqualified. The sheriff expressed concern that he would be a “danger to the public” when he gets out of jail and added a nine-month supervised release order to his sentence.